I also happen to love football. I know so many people who aren’t really into the sport itself but still tag along for the social aspect of watching the games. I wonder if all the delicious tailgating food has something to do with that? I know that if I weren’t a fan of the sport, I’d probably still tag along just for the food. Truth. Over the next couple weeks, I’ll be sharing some of my favorite football snacks with you, in celebration of the impending Super Bowl. Or, at least my most recent football snack favorites. I get bored easily and often have to switch things up. And while my team didn’t come close to the playoffs this year (next year will be Carson Wentz’s year! ), any excuse for a party or party food is good by me. 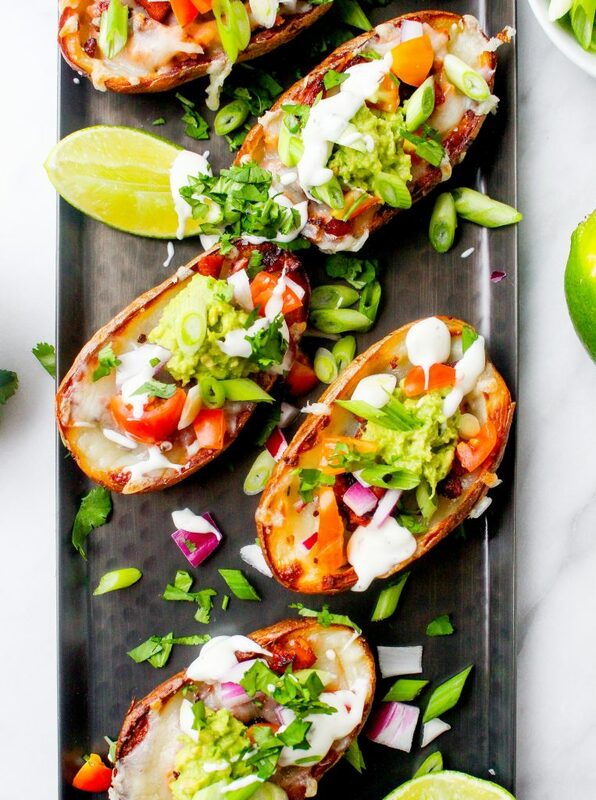 One thing is for sure: these potato skins, despite my chronic, millennial boredom, are not going anywhere. Oh yes, folks, these are here to stay in the regular rotation. 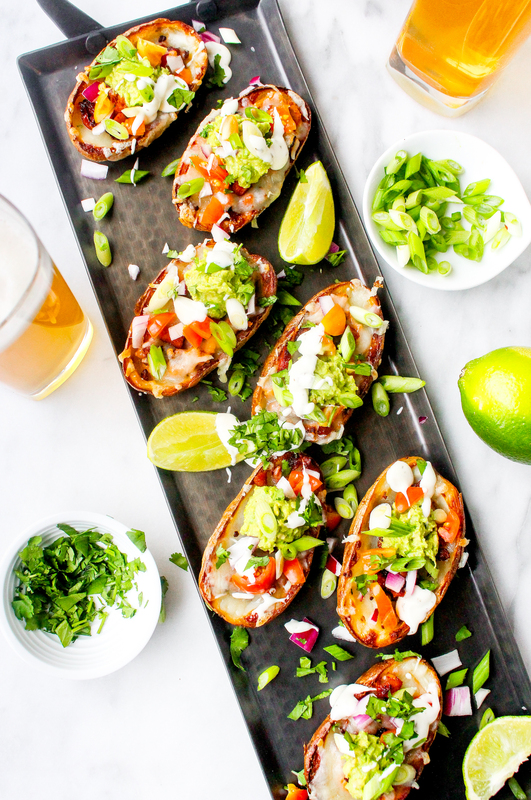 Classic, chain-restaurant-style potato skins are one of my favorite things on earth. I am always tempted to get them if I see them on a menu. The cheese! The bacon! The dipping sauce! Also, I’ve never met a potato I didn’t love. I blame my Irish genes. They’re just so…satisfying. Such a great snack. While I have never deep fried potato skins myself at home, we do eat a baked version with some regularity during the football season. They take a little patience (as do all baked potatoes), but they are sooooo worth the wait. I promise. Especially when you treat said potato skins like a nacho! They start out like a classic: crisped up potato with lots of melty cheese. Then things start to get weird. In a good way. I swap the bacon for chorizo sausage (although, bacon is definitely a good choice. Always. ), and top these babies like they’re nachos! 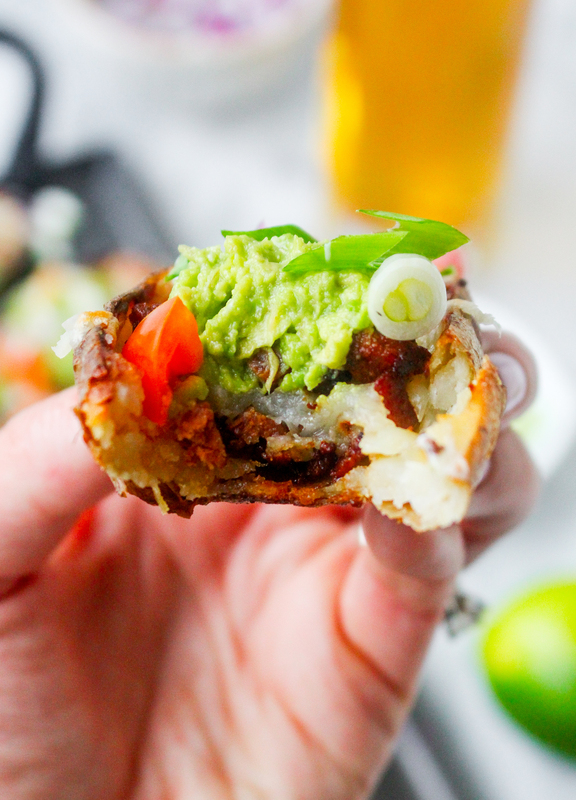 Mashed avocado, fresh scallions, some tomatoes, and a generous spritz of lime juice make these super special and absolutely so festive. Perfect for a party! Also, they’re the perfect match to an icy cold beer. Just sayin’. 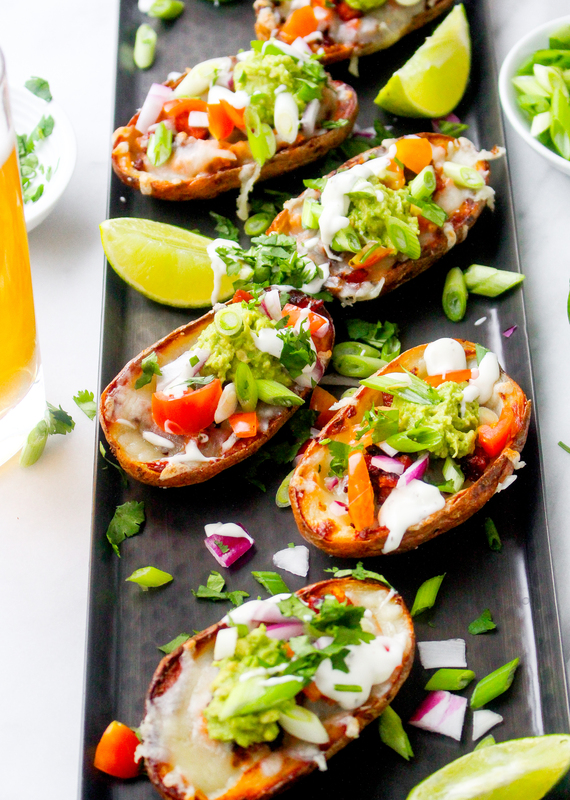 I love these best with ranch dressing on the side, as a homage to the classic, but good ol’ sour cream will also work just fine here. As long as you’ve got something creamy to dunk them into, you’re good. 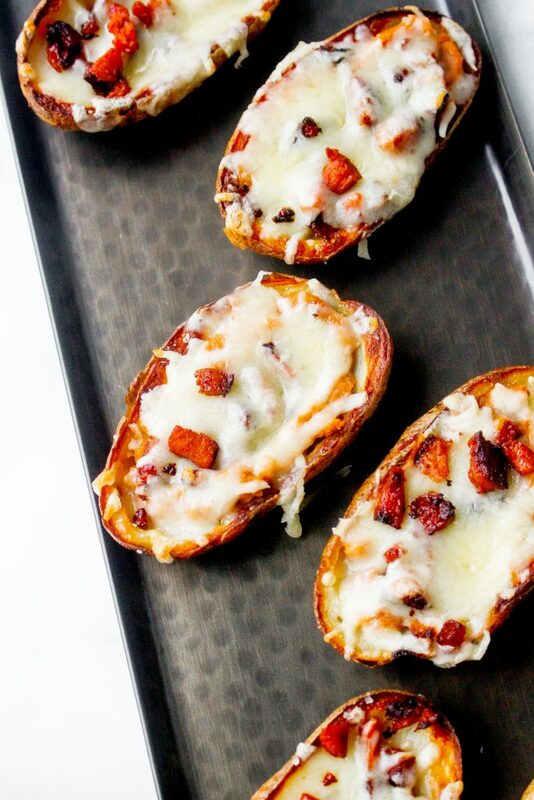 Chorizo potato skins nachofied. Let’s make it a thing. Let’s also make “nachofied” a word. Preheat the oven to 400°F and line a baking sheet with foil. Prick each potato a few times with a fork. Rub the outside of the potatoes liberally with olive oil and season with salt. Place on the prepared baking sheet and bake for 1 hour, or until the potatoes are tender. Remove the potatoes from the oven and increase the oven temperature to 450°F. Once the potatoes are cool enough to handle, halve them lengthwise and scoop out most of the flesh, leaving a ¼-inch border around the edges. Return the halved potatoes to the baking sheet and drizzle the inside with a little more olive oil and another sprinkle of salt. Bake for 10 minutes, flip them over, and then bake for another 10 minutes, or until they are crispy. While the potatoes are baking, cook the chorizo in a large skillet until it is rendered and crispy. Set aside. Prepare your other toppings: shred your cheeses, chop your veggies, and mash your avocado. 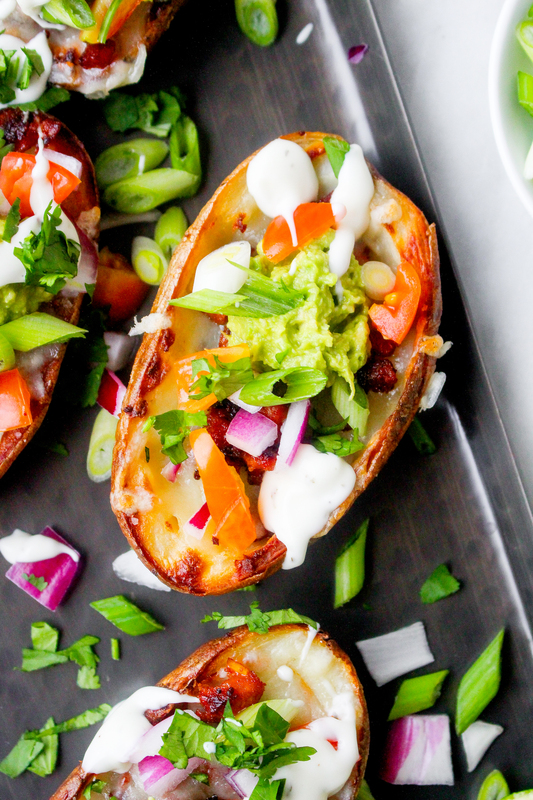 Fill each potato skin with some of the refried beans and the crispy chorizo. Top each with some of the shredded cheeses. 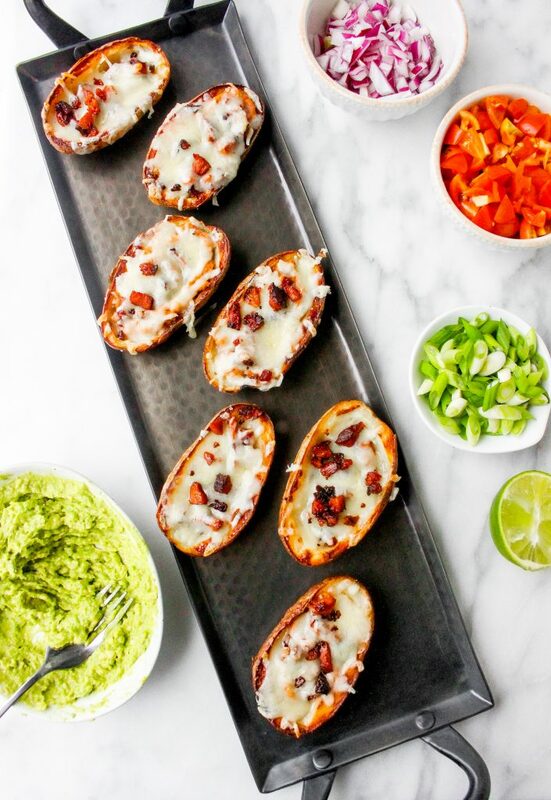 Once all your potato skins have been filled, place the baking tray back in the oven for a couple minutes or until the beans are warmed through and the cheese is melted and gooey. 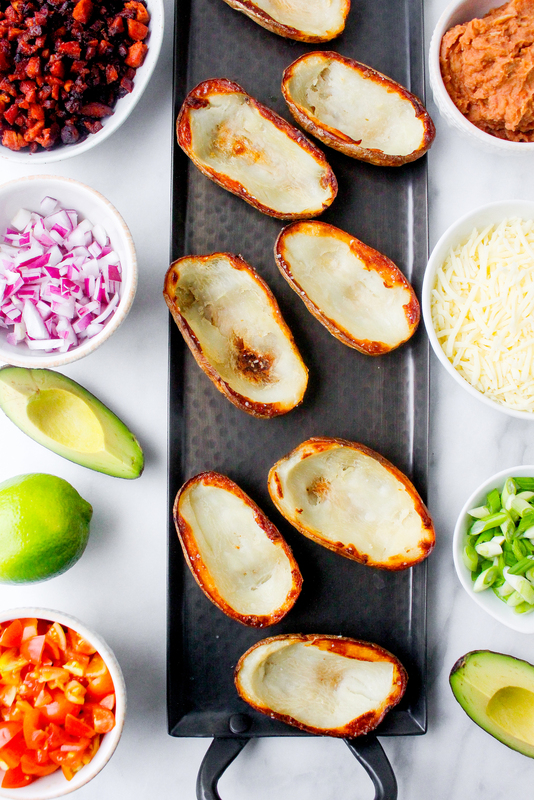 Remove the potato skins from the oven and carefully arrange them on a serving platter. Top each with some of the mashed avocado, diced veggies, and spritz of lime juice. Serve immediately with sour cream and ranch dressing on the side, as optional dipping sauces. I prefer bulk chorizo that is not in casings, but if you can’t find it (I sometimes can't), just remove the casings before cooking so you can crumble the sausage easily. I don’t have a drop of Irish blood in me, but I’m pretty sure I’ve never met a potato I didn’t like, either! 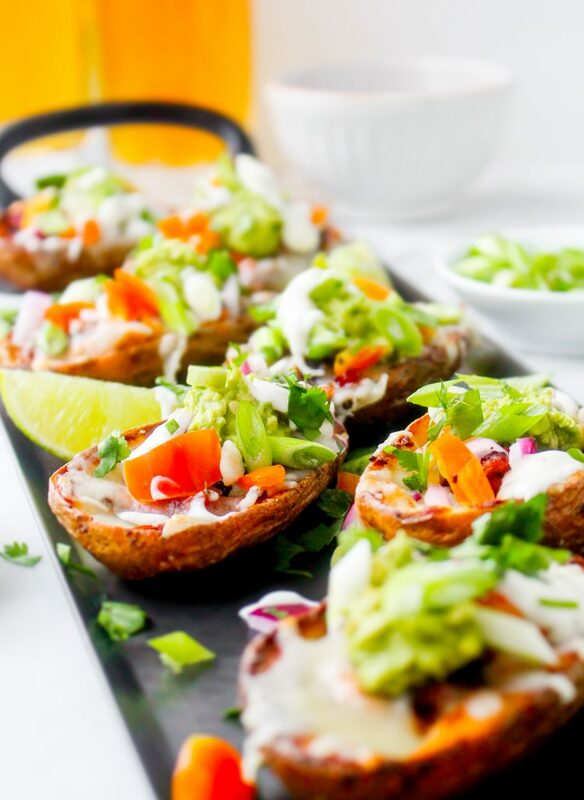 These look phenomenal – combining nachos and potato skins is basically a dream come true!